Time for some art history… Rediscovered this female artist. I saw an exhibition of her artwork together with a friend in Copenhagen some years ago. I have to admit I did fall for the light and the small details in her paintings. 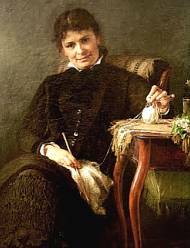 Bertha Wegmann was one of the first professional female Danish painters, successful in her time and very wanted as a portrait artist. She was born December 16th 1847 in Soglio, Switzerland and died in Copenhagen February 22nd 1926. Bertha was the daughter of fabricant Eberhard Ludwig W. (1810-69) and Cathrine Mini (1821-57). As a child she moved with her family from Switzerland to Denmark, where she lost her mother at the age of 10. Her father was an amateur painter and encourages her to develop her talent. He supported her economical until others did step up and ensured her education as history and genre painter in Munich from 1867-81 and later in Paris. Still Bertha lived in poverty during her youth. In the 1860-ties Bertha trained at first in Copenhagen, where she was a pupil of the painters Heinrich Buntzen and F. C. Lund. They both belonged to a generation of painters whose idealizing and national-romantic style of painting was no longer fashionable. At the age of 19, with financial support from the prosperous Melchior family, Bertha Wegmann continued her training in Munich. For 13 years she lived and studied there. Shortly after arriving in Munich she met the Swedish painter Jeanna Bauck, who had come to the city the year before, and they moved in together. Together they made many study trips to various parts of Europe, including the Tyrol, Brittany and Venice. In 1873 she deputed in Charlottenborgs spring exhibition, where she regular until she died. 1880-1881 at last Bauck and Wegmann reached Paris, and Bertha became fascinated by modern French art. She exhibited several times at the Salon in Paris, where she received recognition (a mention honourable) in 1881, and the next year she won the Minor Gold Medal for a portrait of her sister. The Hanging Committee at Charlottenborgs awarded her the Thorvaldsen Exhibition Medal when she exhibited the portrait of her sister back home in Denmark in 1883. After this she had great success, and the same year she became the first women ever to be elected to the Plenary Assembly of the Academy of Art. At the same time she participated in a large number of big, official exhibitions in Scandinavia and Europe and at the world exhibition in Paris 1889 and 1900 and in Chicago in 1893. She also was part of the seminal Women in 1895. 1892 she became one of the first women to receive the Gold Medal of merit Ingenio et Arti from King Christian IX. The long education in Germany and France meant that she acquired the technique and the colour- and scene selection of the predominant contemporary modern art, the so-called Salon art. The endearing portrait of the Swedish painter Jeanna Bauck, painted in Paris in 1881, is a magnum opus. Her friend shown from front, sitting by a table and apparently talking to the painter. The light falls from a window behind her and states her feisty hair. Bertha called it an anecdotal element in this kind of paintings for situation description as a difference to the older traditions of narrative painting. However she really painted genre paintings, not only during her youth but also later. After she returned to Denmark she found a bit by chance a livelihood as a portrait painter. On demand she painted excellent representative portraits of prominent men such as Philip Schou, 1888, F. Meldahl, ca. 1893, Moritz G. Melchior, Otto Bache, 1896, and P.E. Lange-Müller. 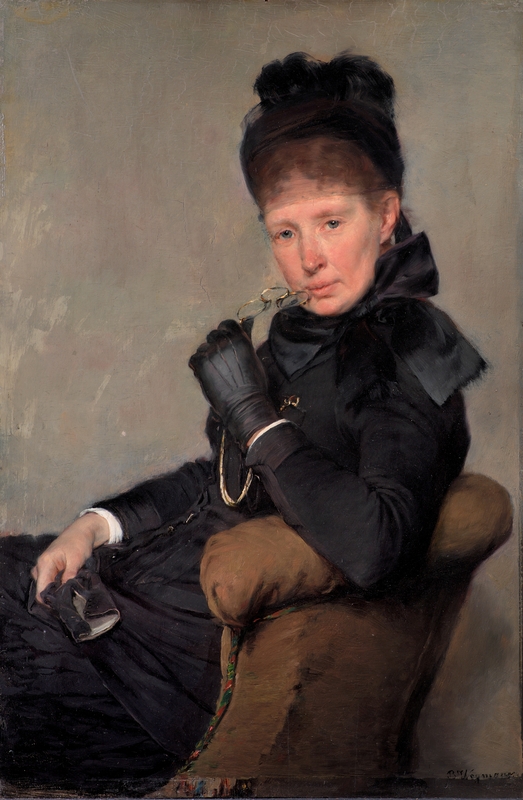 Also in the woman portraits she focused on the individually character, like in the portrait of Petrea Hirschsprung from 1888 and the sister Anna Seekamp from 1880-ties. The stately whole figure portrait of Frederikke Sophie Elisabeth Krag-Juel-Vind-Frijs, 1888, is art of international class. 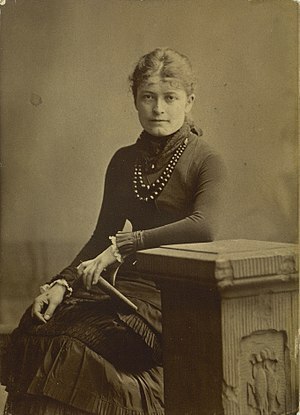 As a member of the board of the Drawing- and Art industrial school for women 1887-1907 Bertha worked active for the education of other woman. 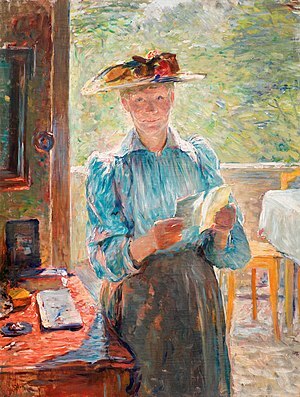 In 1926 Bertha Wegmann died at the age of 79 amidst her work in her studio in Dronningens Tværgade. After her death Toni Müller, her flatmate in the building of the Women’s Reading Association on Gl. Mønt, inherited all the paintings and studies she had left behind. In 1941 Müller sold the whole legacy at auction and founded a grant in Wegmann’s name for the benefit of needy young female artists. Even if she where successful in her own time and on her own way was part of the modern naturalistic break through her art was perceived as strange and not part of the contemporary Avantgarde. I went to Hope Art Gallery in Salt Lake City, Utah and was really struck by her painting “Relfections” (a painting of the artists’ brother). The light behind the man in the painting made it look like he was almost popping out of the picture. I wish there was more information about the story behind that picture, and about her brother. Her brother may not have been famous in any way, and thats why I think the painting is so special. If there is any information on that painting, I would be pleased to read about it. Thank you.